The Scalextric Bugatti Type 59 history. With thanks to: NSCC (www.nscc.co.uk) (March 2007 journal issue). Brian Rogers, Roger Petri, Phil Etgart, Phil Smith, Chris Gregory, Arthur Saunders, Peter Morley, Mark Scale, Derek Cooper, Jonathan Hewitt, Andy Carmichael, Rob Smith, Juan C, Steve de Havilland and, of course, Roger Gillham. The C70 Bugatti together with the C71 Auto Union C-type were introduced in 1964 to complement the successful vintage Bentley and Alfa Romeo Le Mans cars, which had been introduced in 1962. A photo has survived of an early pre-production Bugatti – it seems to have used some modified C65 Alfa bits as it has the same axle mounting, spoked wheels and pin guide. It was reputed to be white in colour but, as only a b/w picture exists, this is not certain. The original production run is unknown – the accepted estimate is that only 600 C70 Bugattis were made and around 50 of the later C95 Race Tuned version. The differences between the two are the shade of blue, the motor and the steering assembly. When the Race Tuned cars were introduced, Scalextric also updated the C70 Bugatti, giving it the reference C95. This type had better (stronger) front suspension but it still performed badly and rather than risk damaging their reputation Scalextric did not release it. The colour of the Bugatti was, of course, blue! The C95 being produced in a darker shade than the earlier C70 version. The only other original colour known to exist is a single car in red. In 1983 an ex-toolmaker from Havant was in contact with Roger Gillham and sold him a red Bugatti. This was a mould test that pre-dated the original production Bugatti. Three of them were allegedly manufactured but only this one survived. It was in the same bright red as the type 3 Lotus 16, late D type Jaguars, medium head Listers and Aston DBRs. It is also possible that the base was incorrectly stamped C71 which might explain Roger referring to the Bugatti as a C71 in an edition of his book. The C70 Bugatti was only sold by the major English Scalextric dealers such as Hamleys and upon written request from the factory. The later C95 Bugatti was never sold in shops, only directly by the factory. The C95 Bugattis were assembled in batches of six by the prototype department, after they had received enough orders. Outside the UK both types were mainly only available direct from the factory. It was possible to obtain one as late as 1969 as can be seen from the letter. Arthur Saunders was the buyer and this particular Bugatti cost £1 6s. The 1967 retail price was £2 6s. 4d. The Bugatti was never supplied in a ‘proper’ box. An unlabelled light brown cardboard box (like the Hong Kong ‘export’ box) was used. The only Bugatti box known is a Formula Junior one labelled ‘C70 Bugatti (1934)’, which belonged to Triang’s Scalextric representative. Tyres: Dunlop (small letters) the same as C64 Bentley, C65 Alfa Romeo and on the front of the C71 Auto Union. Body material: injection moulded plastic. Data on underpan: C70 Bugatti Type 59, Triang Scalextric Regd., Made in England, British Pat. No 874.315, Foreign Patents Pending. Production total (estimate): 600. Survivors known: 60/75 (dealers’ estimate). Production total: Possible three but only one known survivor. Production total: one, photograph exists, car believed destroyed at the time. Note: it has the same front axle mounting, red wheels and round pin guide (G3) as the C65 Alfa Romeo, thus no steering. Guide: G12 (blade) with steering mechanism. Wheels: production differences to C70. The spigots on the king pins on the C70 car are thinner, and have a split at the end like early Formula Junior king pins have. The C95 spigots have a round “ball” at the end which has to be forcibly pushed through the wheel to make it fit. The spigots on the C95 king pins are more substantial than the C70 ones. This mirrors the changes made to the Race Tuned version of the Auto Union, which also has more substantial spigots and retooled front wheels. Data on underpan: as C70 – note catalogue number not changed. Colour: Blue (darker than C70). Production total: less than 50 (estimate). Note: these cars never had Race Tuned stickers as pictured in the catalogue. 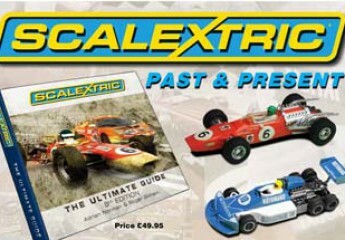 In 1982 Scalextric considered re-introducing the complete “Vintage” range (ie. C64 Bentley, C65 Alfa Romeo, C96 Auto Union and the C95 Bugatti). They tested most of the moulds, making a quantity of white Bugatti body-tops and black bases, together with black drivers’ arms and mirrors (since these were on the chassis sprue). The quality of the one example seen at the time was considered as acceptable for a repeat re-run of the body top and underpan in red. White Auto Union bodies were also made, as were complete white C71 Auto Union steering units (but in a much softer material than the originals) and black Race Tuned C95/C96 steering units (without stub axles, since they could not find the moulds). Following these trials, Scalextric did not re-introduce either the Bugatti or the Auto Union due to insufficient mould tools. One Saturday during 1982 Hornby had arranged for a team from Barbados to race against a British team. The majority of the home team came from the Molesey club and included Roger Gillham, Martin O’Reilly, Brian George, Chris Gregory and others. The race track was situated very near the shop floor of the factory and, due to Chris Gregory’s lack of speed, he didn’t make the team. While others practiced he wandered round the shop floor; in the middle was a raised office/observation point with four glass sides. On a shelf along one side he spied the ‘white Bugatti’. After the racing there was an ‘official’ tour of the factory; Chris guided Martin past the find and the rest is history. Hornby agreed to produce a commissioned run of Bugattis for Steve de Havilland’s company, ‘Traffic’. Whilst commissioned by ‘Traffic’, the cars were produced by Hornby and should therefore be regarded as re-issues. Hornby accepted an order for a quantity of yellow, green and red Bugattis. 25 body tops were produced, but only 23 of them were good enough mouldings to be considered worth making into complete cars. The remaining two were riddled with rust, caused by a damp body top tool. It is believed 273 black bases were produced, and it is assumed that, having produced the bases, the run of tops was prematurely halted when the mould damage (corrosion resulting in excess flashing) became apparent. 100 of the black bases were matched to the extra red tops and a number of these were then sprayed blue by John Jude. At the time of this production run, the 2nd series white Auto Union with clear rather than chromed parts was produced. At the same time the factory also ‘found’ a quantity of 1/24 figures moulded in orange plastic and a batch of blue C48 Tyrrells which had been sent to the factory at the time it was due to be introduced into the UK range. The Hornby re-issued Bugattis, which should not be referred to as ‘de Havilland Bugattis’ since de Havilland is a registered trademark, were assembled using a variety of components. Initially Colin Penn manufactured parts in white metal including a front axle which took the then current guide. Around this time Colin also produced complete white metal Bugattis. Barry Smith, BTS Mouldings, produced a fiberglass type front axle assembly with metal pins that pushed through to locate the wheels. Barry then produced resin parts for the Bugatti including the front steering assembly. Around this time John Jude also had resin parts produced for his sprayed cars. In the early 1990s approximately 50 of the surplus black bases were built up by David Lyttelton using a black body top moulded in a material called Colorthene (half resin. half plastic which can he cold moulded and is not as brittle as resin). These were supplied as a body top only and then built up using BTS parts and, later on, Pink-Kar parts. First ones with steering mechanism, most later ones without. Ancillary parts in white metal by Colin Penn or resin by BTS. Yellow – body & underpan = 110. Green – body & underpan = 110. Red – body & underpan = 160. Red – body only = 100. See John Jude section. White – body only = 23 (from tests made in 1982). Supplied with black underpan and white C71 steering unit (G10 Guide) or black C95 steering unit (G12 Guide) without stub axles. Black – underpans only – 273 (from tests made in 1982) See John Jude and David Lyttleton sections. The red Bugatti top and base “kit” initially sold for twelve pounds, and the yellow and green kits were sold for fifteen pounds. Hornby’s ‘trade’ price for the second (yellow and green) order was higher than for the first (red) order. General note: Due to corroded mould tools the quality of the ‘de Havilland Bugattis’ is variable and most of the bodies exhibit small rust marks in the plastic, this is most notable towards the rear of the car. Most were assembled using a variety of components and often hand finished / assembled and parts fitted using glue. The 1983 re-issue Bugattis were made in red, yellow and green. These bodies show two mould marks on the rear behind the petrol filler caps. The black arrows indicate the marks which are particularly clear on the 1983 re-issue Bugatti due to a blemish in the steel mould. Guide: G12 with steering mechanism. Tyres: as C70 or tyres from M&N. Data on underpan: as C70. Parts from BTS or Pink-Kar or self made. Colour: Light blue and dark blue (original red top and black underpan sprayed). David Lyttleton (England) Repro Scalextric Bugatti top on original (1982 “tri-ang”) black underpan. Underpan material: injection moulded plastic. Standard colour was blue with red available to special order. As both of these were painted after manufacture the colour was largely irrelevant. The cost was £95. Tyres: self made, without Dunlop lettering. 200 should have been made. Total production is uncertain. Perris also made a box (a flimsy copy of the C64 Bentley box) and fictitious C95 instructions, based on those from the C96 Auto Union. The injection moulded type 59 Bugatti from Pink-Kar in blue, black (limited edition), white, green, red and yellow is the cheapest and most accurate one. Pink Kar also produced a special anniversary set which also contained a chromed replica Scalextric Auto Union. Occasionally an interesting fake ‘Scalextric’ black Bugatti turns up – constructed from a 1983 re-issue base and a Pink-Kar top, thus producing a black plastic car (as opposed to the ‘Lyttelton’ resin version) complete with genuine Scalextric branding on the base. It is still not known whether Pink-Kar somehow acquired the original Scalextric moulds or worked from an existing car. The Pink-Kar version hardly shows any of the imperfections of the 1983 Hornby re-issue. It is thought that Pink-Kar’s first pre-production Bugattis showed the full Scalextric markings on the underpan. This would also provide the collector with the predicament of accurately identifying this as a Pink-Kar item which could easily be mistaken for an original Scalextric car. Data inside underpan: Pink-Kar, Made in Spain, CV001. Box: Pink-Kar box with No. CV001 (silver overprint). Pink-Kar, Made in Spain, CV002. Box: Pink-Kar box with No. CV002 (golden overprint). Chrome plated on brown plinth. Base colour: light blue. Production total: 40. Data on underpan: Edicion 300 Limitada (as black one, very clever!). Data inside underpan: as light blue one. Box: Pink-Kar box as CV002 but without number. Note: Given to Pink-Kar dealers in 1995. Club logo. Made for MCIC-members (Spain) in 1996. White, green, red and yellow (different shade to Mini Classics car). Bases marked ‘300’ are the Pink-Kar limited edition copies. An unknown maker from Spain created resin copies of the 1983 re-issues (you can tell their origins by the same faults in the rear body) they have been found in blue, black, red, and yellow but other colours may exist. All parts are from Pink-Kar. Production numbers of the above cars are not known and other colours may exist. Mark Scale, of Scale Models, has seen two white re-issue versions with proper white bases instead of the usual black. On the replica front there are a few Pink- Kar versions with full Scalextric branding on the base as opposed to the plain production versions so you need to be wary if offered a ‘genuine’ Bugatti with Pink-Kar parts! Such a valuable car is always going to spawn outright fakes so “buyer beware”. Original blue body top with replacement parts. This example has a genuine Scalextric body, un-plated front wheels, tyres, filler caps and the brown bonnet straps. resin rear wheels, resin wheel inserts, resin exhaust, radiator and oil cooler. Front axle assembly probably from a Pink-Kar donor car. Base appears to be a 1983 Hornby re-issue black base painted blue. The base has all the proper writing. Unverified body top with replacement parts. This looks like a 1983 Hornby re-issue white body top with a black base. Fitted with the unusual steering from an Auto Union? The chassis ends do look a little like resin. 1983 Hornby re-issue body/underpans have been in resin which will also show the blemish behind the filler caps. It is known that Scalextric used various existing bodies to test the new Power Sledge motor (E8) in 1968. The front (body top) screw pillar was ground down underneath the bonnet to allow the drop arm/front of the sledge to fit into the car, and thus to work properly. The chassis was cut up and only the rearmost third of it was used, the part under the driver forwards was removed. The fact that a C95 race tuned body has been used lends credence to this story but it is entirely possible that the car was just modified by a club racer in the 60s. Nobody knew how valuable these cars would become at the time and several are known to have been altered to make them more competitive. This particular car was in Peter Morley’s collection for several years and eventually ended up in Australia where it came to a sticky end. Its owner ran a furniture manufacturing business and converted one floor of the building to house his extensive collection. In the late 1990s a fire destroyed both the building and collection which included many other unique or prototype items including the ‘Articulated Gravel Truck’, the Lancia Delta prototype and the Lego style truck. Enthusiast M Ronald has converted several Pink-Kar Bugattis into power sledge configuration purely from a racer/builder interest.